Thanks to Gonzalo Mon of Kelley Drye & Warren LLC for flagging this story. It’s a really important one for those thinking they can get away with paying for endorsements without telling their public. I hope the pay-for-play blogger companies take note. “In January 2014, AdAge interviewed me about news reports that Machinima had hired influencers to create videos promoting Microsoft’s Xbox One gaming console and games. In a native advertising campaign, the influencers posted positive reviews, but didn’t disclose that they had been paid to do so. During the interview, we speculated about whether the FTC might take action against the campaign and what the result might be. Now, almost 20 months later, we have the answer. This week, the FTC announced a settlement with Machinima. According the to the FTC, Machinima, the operator of a popular YouTube network, paid two influential gaming bloggers to create videos promoting the new Xbox One console and three new games, but didn’t require the bloggers to disclose that they were paid for the reviews. The bloggers posted four videos that had more than 1.6 million views. To capitalize on this success, Machinima later recruited and paid more people to upload positive reviews, again without requiring a disclosure. This generated another 300 videos and 30 million views in a five-week period. Are brands getting what they intend when they pay their ‘social influencers’? I don’t have big numbers to share. I have five anecdotal conversations – each with a CMO, or equivalent, of organizations ranging from $35m to just shy of $1bn revenue. Here’s the first. There’ll be more to follow. This East Coast marketing chief paid $9,000 in total to get five bloggers to write two blog posts and a minimum of four tweets over a four-week period about their supposed adoption of a new tablet accessory. These tweets were then re-published as part of the vendor’s launch invite activities. Each blogger then attended the San Francisco launch earlier this year. That’s approx. $1800 each person. How do these ‘social influencer’ peddlers still exist? In the B2B sector every in-house Marketing VP, Audience Manager or C-level immediately understands that their organisation’s customers & prospects are primarily influenced offline and through online search. Those that meet their customers know that these people aren’t glued to Hootsuite all day long, picking up whatever’s being posted on Twitter, Facebook et al. They laugh at even the thought of it. So it still bemuses me there are other self-appointed ‘influencer platforms’ that effortlessly transpose the word ‘influencers’ for ‘social influencers’ so as to promote their own Twitter- or blog-trawler software. I used to wonder how these companies exist – because if they met any of the corporate buyers I meet they’d be laughed out of the office. In perhaps every B2B sector that I know of, ‘social influencers’ are in the very extreme minority – less than five per cent. Then I came to understand how these platform providers exist. They sell to marketing agencies. And marketing agencies just don’t care about real market influencers – they care about numbers of people who they can outreach to. The game is to continuously ‘top up’ those outreach numbers. Even if those people have only the most tenuous connection to their client’s sales prospects. So why don’t the in-house managers spot this and call out their marketing agencies? Because too many in-house managers themselves never meet real sales prospects. And so also have no understanding of who they’re really influenced by. This cycle has to stop. Company offers a guarantee on how its social influencer marketing campaigns will perform! Oh dear. When a company makes the following promise to its clients … I know they’re measuring the wrong thing. If only buyers were so predictable. Among the most stupid opening lines from an ‘influencer marketing platform’ vendor I’ve read all year. How did they make the giant mind-leap from ‘influencer’ to ‘blogger’ without even the slightest explanation? Some bloggers are influencers, and some influencers are bloggers, but in most markets there’s way less than 30% correlation, and often it might only be in single figures. Who are they trying to fool? The unbelievable return of EAV (Equivalent Advertising Value) metrics to blogger outreach. Has marketing forgotten what it learnt twenty years ago? In the 1990s I ran a PR network in Europe. Agencies looked a lot at measurement techniques for the media coverage they were achieving on behalf of their clients. For a short while the industry used an EAV (Equivalent Advertising Value) metric. Some clients liked it but it was always a house built on sand. What was the point of knowing that a particular press clipping on page 87 of a monthly magazine would have cost $190 were someone to have advertised in that spot? The client wasn’t advertising in that spot (for no doubt good reason), the magazine didn’t take ads on that page (so the EAV was an arbitrary value anyway), and the coverage was not exclusively focused on the client (as any ad would have been), so the comparison was impractical from every view. Clients soon saw through it and agencies dropped the metric. Why raise a claim that could be so casually, and easily, shot down. This issue sprang to mind when I was recently reviewing what’s being called ‘blog outreach software’. 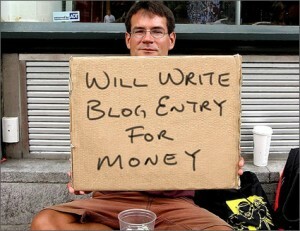 I couldn’t be more critical of the current generation of blog outreach software. It’s nothing more than extremely low-end advertising. The bloggers being courted by these software providers are only interested because of the payments they’ll receive when mentioning particular products or services. If the bloggers have any current influence, and there’s no proof they have, that will be immediately lost once they start product placing within their posts. But the thing that most struck me when looking at this software were the metrics they were using to measure the validity of each blogger. ‘Potential impressions’ and ‘estimated impressions value’! Two entirely hypothetical metrics. Have people learn’t nothing in twenty years? I well remember a marketing director in the 1990s tell a large group of employees that the ultra-expensive Formula 1 sponsorship deal he’d just signed (the firm’s logo was on a car’s wing mirrors) had a potential TV viewership of hundreds of millions of people. He justified the spend by multiplying the likely TV viewing numbers by the length in minutes of each televised race to arrive at that number. As if the tiny wing mirror logo (on two of the twenty cars) would be visible for even 1/100th of each broadcast! In reality it was more like 1/1000th. So for blogger outreach, why measure each blogger by ‘potential impressions’ and ‘estimated impressions value’? Why is this any more credible in the era of bloggers than it was in the far more stable, and less busy, era of print titles? I look at the (mostly) agencies supposedly using this software and I wonder what story they’re telling their clients. This post from UK Marketing News reports on the astonishing rise in marketing tech vendors over the past few years, up from 100 in 2011 to 1900 this year! It states that influencer marketing is one of the specialist areas behind much of that rise. Influencer50 has issued the latest in its series of White Papers this week, WP#19, ‘Where’s the evidence for investing in B2B ‘social influencers’?’. It asks why Heads of Marketing in B2B organisations are still believing that social media outreach will reach those people most influencing their sales prospects, when there’s little to no supporting evidence. It quotes recent research from the American Marketing Association, Neilsen Online, ad agency RSW/US and Influencer50 itself to question the logic of assuming ‘social influencers’ are a legitimate target audience. It may not be what many of those in marketing roles want to hear right now – but it’s a compelling argument. How will the ‘social influence platforms’ justify their business after this week’s Buyersphere 2015 report? I’m looking forward to seeing if, and how, the Twitter-trawling ‘social influence platforms’ react to this week’s Buyersphere 2015 report from B2B Marketing & BaseOne. I wrote about it yesterday. The standout finding was that 50% of all B2B purchasing decision-makers didn’t use social media at all to shape their buying decisions and that just 5% of the >200 respondents said they referred to Twitter at any stage for help in their decision-making process. This was the second-lowest score, just edging out the 4% who used Pinterest. So when agencies trawl Twitter for the noisiest people on particular subjects, and then sell that information to vendors / brands claiming them to be the key market influencers, perhaps the vendors will start to think again. How can they still back up that claim? Congratulations to Azeem Azhar, someone I’ve always liked, who just before Christmas sold his UK-based firm, PeerIndex, to Brandwatch. PeerIndex was fleetingly a competitor to Klout, at the time Klout was claiming to be ‘the standard for influence’. But I always had a lot more respect for PeerIndex, mostly because of Azeem himself, who I first met fifteen years ago. With PeerIndex he first created clever technology without an obvious commercial use, which he then repurposed to enter the market that Klout had forged – that of ‘online influence metrics’. Much as I never bought into the concept, or its relevance to buyers, I could always respect him as an innovator. Though he’s moved to Brandwatch for the next few years, I’m sure it’s not the last company he’ll create. Congratulations once more.